This September brought the annual Bioblitz to Batten Bay in Plymouth Sound. 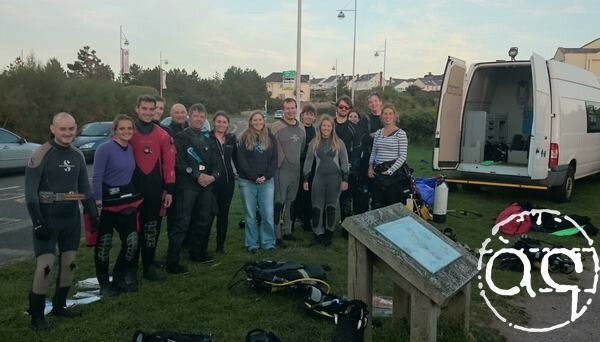 On Friday 12th September Aquanauts team and club members ventured over to Mount Batten to sign in and start getting ready for the evening shore dive. These 24 hour events record biodiversity in the marine environment, and a range of other coastal habitats within a set boundary. The idea was to ID and record as many species as possible. We all set off with our slates and cameras in our buddy teams and went out to different parts of the bay as dusk was settling in. After 45 minutes divers started surfacing with many species listed such as Common starfish, Velvet swimming crabs, Kelp species, Cushion stars, Tompot Blennies and many more! Back to the tent we went to get the books out to ID what we didn’t know and pass on our findings to the Marine Biological Association who were running the event. A total of 860 species were identified above and below the water for the whole event, what a brilliant team effort, well done all! ← Look out for some great dive trip reports coming soon!